A banner was placed along County Road 500 near the north end of Vallecito Reservoir in 2014. Dylan’s father, Mark Redwine, lived in the area and it was the last place the teen was seen in November 2013. 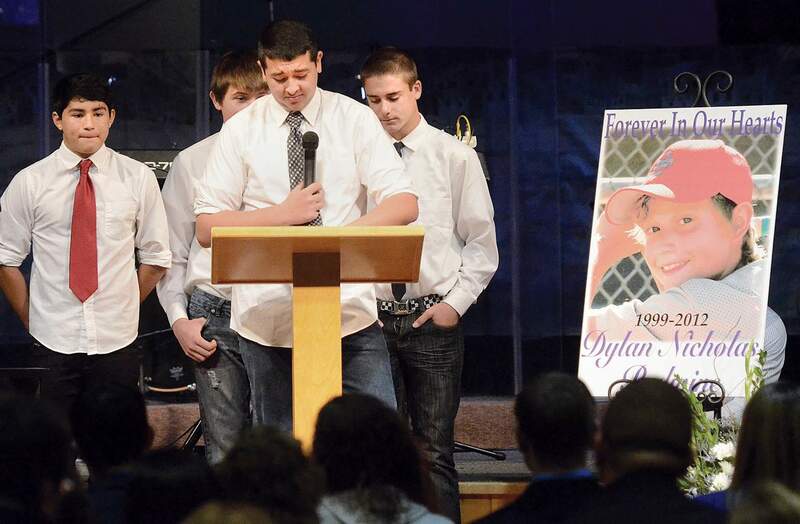 Fernando Stubbs, 15, front, and other close friends of Dylan Redwine share stories about him on Nov. 15, 2013, at the Pine Valley Foursquare Church in Bayfield. In back are Ryan Nava, 14, left, Wesley Herring, 15, center, and Christopher Kane, 15, right. Elaine Hall, mother of Dylan Redwine, is interviewed during a rally across the street from Mark Redwine’s home on Jan. 26, 2013, just a few months after the teen went missing. He was last seen at his father’s house in Vallecito on Nov. 19, 2012. Mark Redwine was arrested Saturday in connection with his son’s death. 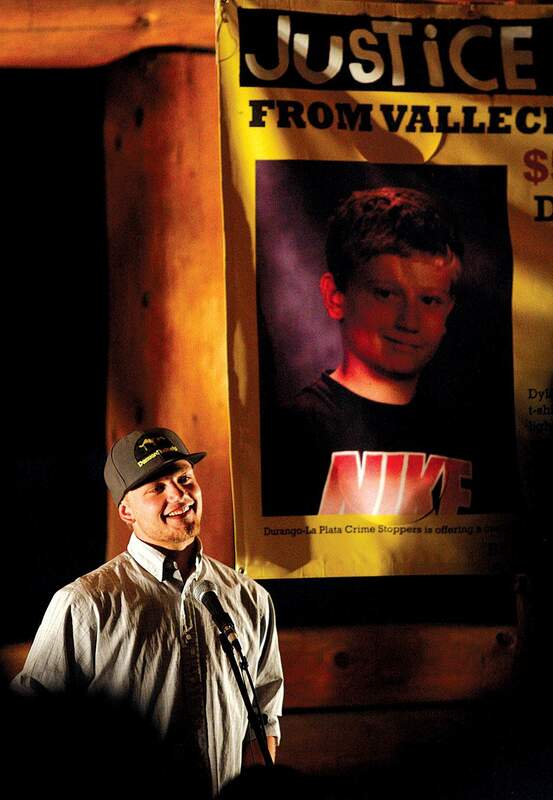 Cory Redwine, shares a story about his younger brother during a vigil held Nov. 27, 2012, in Bayfield. 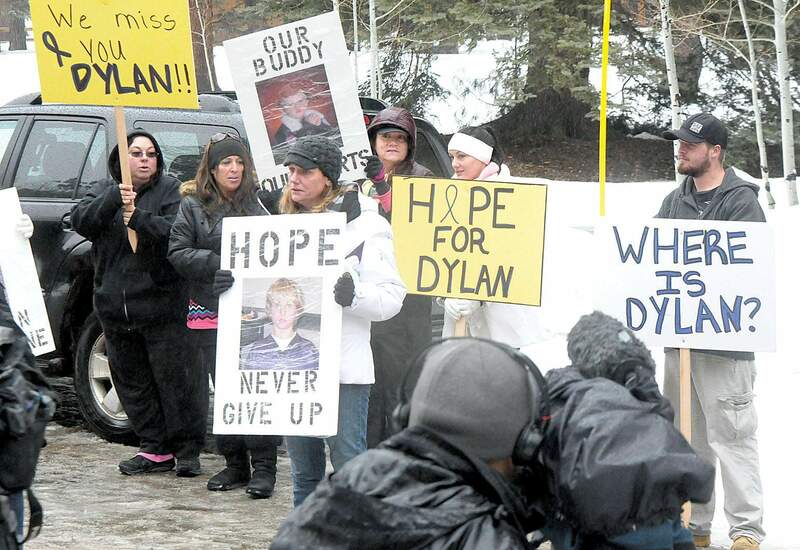 Dylan, then 13 years old, went missing Nov. 19, 2012 while staying with his father on a court-ordered visit. His partial remains were later found in June 2013 and his skull was found in November 2015. His father, Mark Redwine, has been indicted in connection with the death. He faces charges of second-degree murder and child abuse resulting in death. 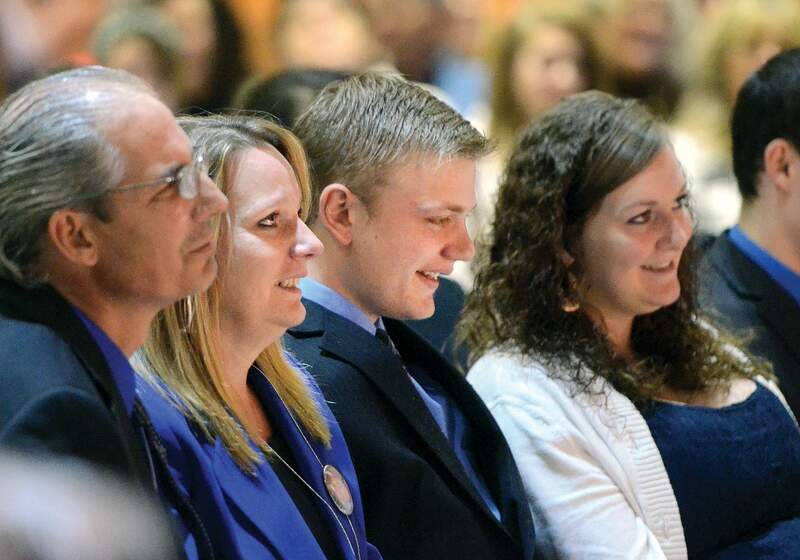 STEVE LEWIS/Durango Herald - BAYFIELD - 11/16/13 - From left: Mike Hall, Dylan Redwine’s step-father; Elaine Hall, his mother; Cory Redwine, his brother; and Krystal Guilliams attend a memorial service for Dylan on Nov. 16, 2013, at the Pine Valley Foursquare Church in Bayfield. 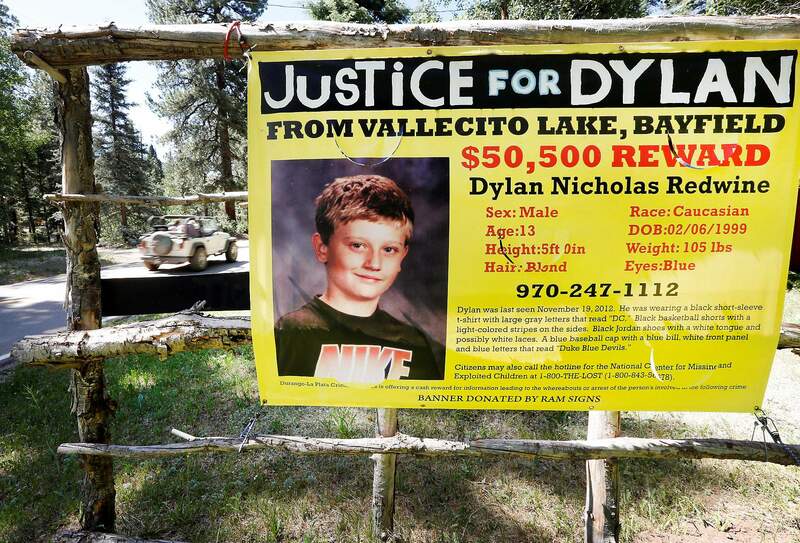 Dylan, then 13 years old, went missing Nov. 19, 2012 while staying with his father on a court-ordered visit. His partial remains were later found in June 2013 and his skull was found in November 2015. 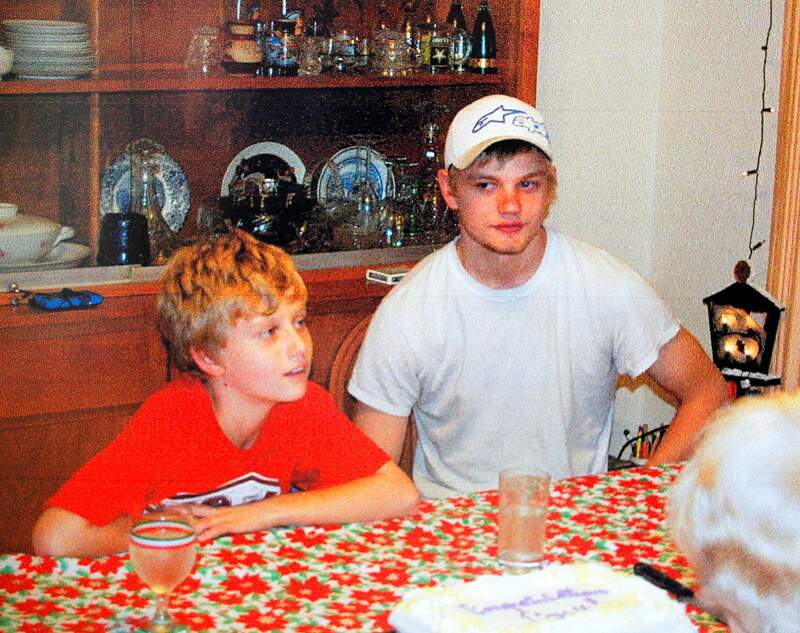 In this undated family photo, Dylan Redwine is seen with his brother Cory Redwine. Dylan lived in Monument, but was in Durango over the Thanksgiving holiday in 2012 to visit his father. He disappeared a day after arriving in Durango. His father, Mark Redwine, has been indicted in connection with the death. He faces charges of second-degree murder and child abuse resulting in death. 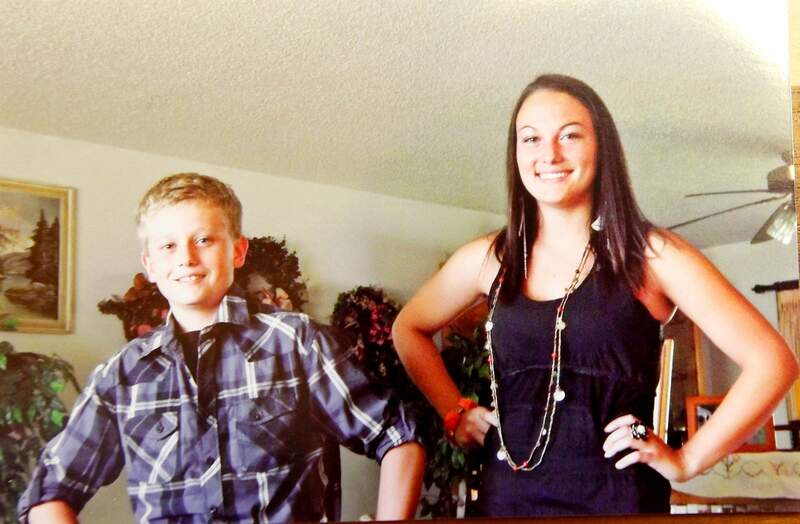 Kaitlynn Boldt, 20, Dylan Redwine’s, cousin, appears with Dylan during summer 2012 in this undated family photograph. Dylan Redwine didn’t want to visit his father in November 2012. But he didn’t have a choice. A court order granted Mark Redwine visitation rights over the Thanksgiving holiday, and Redwine chose to exercise those rights in 2012. Dylan, who was living with his mother in Colorado Springs, decided to make the best of it. He planned to spend as much time as possible with friends in Bayfield, where he used to live. He boarded the plane Nov. 18, 2012, with mixed emotions. “He gave me a big old hug, and I told him I loved him,” his mother, Elaine Hall, said during an interview Sunday with The Durango Herald. It was the last time she would see her son alive. “I think about it every day,” Hall said. Mark Redwine was arrested Saturday in Bellingham, Washington, 4½ years after his son’s death. A La Plata County grand jury indicted Redwine last week on suspicion of second-degree murder and child abuse resulting in death. A booking photo released Saturday shows Redwine with disheveled hair and blood-shot eyes. He is expected to face extradition proceedings in Washington before being brought to Durango, where he will be advised of the charges. Dylan’s blood was found in Mark Redwine’s living room. A cadaver dog detected the scent of a deceased body in the living room and in Redwine’s pickup bed. Dylan’s skull was found in November 2015 just off Middle Mountain Road with what appeared to be knife markings. The skull appeared to have been moved from a previous location where remains had been found. Nearly all of the details contained in the indictment are several years old, leading some to question why an indictment wasn’t issued sooner. Pete Klismet, a former FBI criminal profiler, told the Herald on Sunday that when he was asked to build a profile around a suspect, it did not take him long to identify Redwine. “It was an inescapable conclusion,” Klismet said. In an interview Saturday, La Plata County Sheriff Sean Smith said it was a “cumulative” effort that led to Redwine’s arrest, including recent developments, which he declined to expound upon. Hall has a different view: She credits a new sheriff and a new district attorney for giving the case new life. District Attorney Christian Champagne said he looks forward to resolving the case. “We’re working to bring justice to Dylan Redwine and his family and work toward bringing closure and resolving this case for our community,” he said. Klismet said Sunday he was surprised to learn about Redwine’s arrest on Saturday. Hall described Dylan as a typical 13-year-old boy in some respects: He liked video games, playing catch with his older brother and exploring the outdoors. But he also had a heightened awareness for other people’s feelings, his mother said. “He was easy to raise, because he was so compassionate,” Hall said. Dylan wanted to spend Thanksgiving with his mother, brother and grandmother, who had been ill, she said. Hall does not blame former 6th Judicial District Judge Dickinson for the visitation order – “Judge Dickinson didn’t kill Dylan, Mark did,” she said – but she said mature 13-year-olds like her son should have more say when it comes to visitation. Surveillance video obtained Nov. 18, 2012, from the Durango airport and Walmart show little to no interaction between Dylan and his father, the indictment says. Dylan probably had no idea how violent his father could become, Hall said. Redwine called Hall the next day to say Dylan was missing. Hall knew right away something was wrong. “If he ran away from his dad, he would have called us,” she said. Earlier that year, Dylan had seen “compromising pictures of Mark Redwine,” according to the indictment. Dylan had asked his older brother, Cory Redwine, to send the pictures so he could confront his father about them. Hall declined to discuss the nature of those photos Sunday. Redwine told investigators Dylan may have seen a contempt of court document on his kitchen table that was unfavorable to his mother, which may have upset him, according to the indictment. “I don’t think anyone will know what happened that night, unfortunately,” she said. “... Mark will never say.